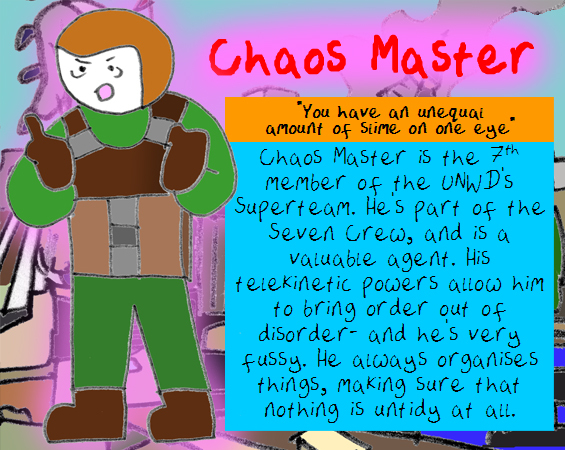 Glan Sterling, AKA Chaos Master, is the 7th UNWD agent, and the first member of the Sevens crew. 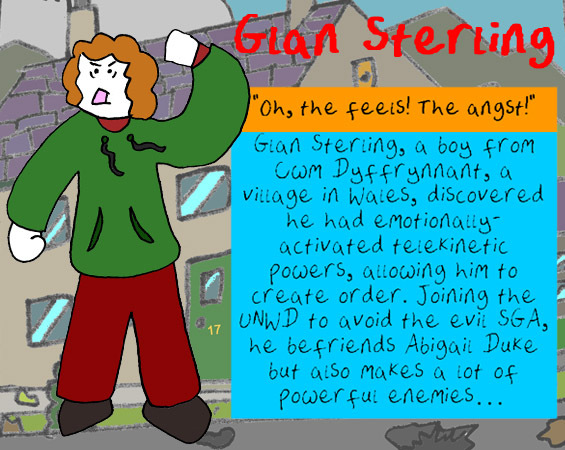 Glan has ginger hair, messy when he was young but shaved short in the Slug-Man stories. As a child, he was typically seen wearing a green hoodie and red trousers, while as an adult he wears a green top and trousers, and brown shoes and gloves. His armour is bulky, brown and grey. His telekinetic powers are pink. As a child, Glan was significantly more laid-back and less anxious, although still fussy. Post-origin story, he is stoic, strict, and says very little that isn't about tidiness, and is shown to be overwrought and fussy to a fault. Glan can control anything disorganised or chaotic telekinetically- but only if he then tidies it up. He can also form psychic shields to guard against exploding UberGun bullets and the like. As of his origin story, he was kicked out of his house as a teenager by his hoarder father after tensions in the home. Sleeping under a bridge with his few possessions, he soon discovered that his obsessively neat tendencies could be somehow channeled into telekinetic powers, tidying his surroundings. While tidying the underpass, he was spotted by Abigail Duke, a young woman who confronted him about his powers that night, shortly before being captured by the SGA and SGA Interrogator Kei Akerele. Knowing nothing, he had little to confess to Akerele, before they were interrupted by Agent ? and Jonah Gordonson rescuing Glan and Abigail. They were offered a place as agents in the newly-forming UNWD, which he and Abigail accepted. Glan's first failure in using his powers came when he failed to prevent the SGA building from collapsing after being blown up by a bomb Kei Akerele placed earlier. Later, Abigail bid a sad goodbye (after being revealed as an Inexplicablite) but helped him unlock his inner power, fine-tuning his abilities to where he can save both Abigail and Naomi from the UberGun's bullets, using the gold powers to block a bullet and pink powers to dismantle one in midair. After telling the others that Abigail had died, he began to move on. He works in the UNWD, and is an indispensable member of the Sevens Crew. He is seen in the Break Room in episode 6, and then in the UNWD Mission Jet on the way to the battle of London. He is shown to be significantly more anxious and compulsive than his child self. Abigail is Glan's friend and companion. They are shown to be close, although very different. Gordonson and ? offered Glan a place in the UNWD as Agent 7 because of his skills, and they protect him from the SGA. Blake and Glan seem to get along fairly well, although he did not seem to mourn his death very intensely. In Story 2, Glan is shown to have a tense relationship with the rest of the crew, because of his fussy, highly strung personality. He is quick to point out their faults, saves Sarky and Grav Guy from a falling building (although seemingly more concerned about the building than his teammates) and tells Sarky to shut up. His father, F. Sterling, kicked him from the house as Glan's fussiness contrasted with his hoarding. Glan understandably dislikes the SGA, namely Kei Akerele, who interrogated and attempted to explode him. Also understandably, Glan dislikes the Zopran leader Glog Bolg, who froze him with T.E.H. L.A.Z.O.R. and caused endless chaos. He seems to be more occupied with order-causing than actually protecting people. The nicknames given to him by Abigail include Mister Master, The Order-Causer, The Telekinetic and his superhero alias, Chaos Master. He may be interpreted as having some form of OCD (obsessive compulsive disorder).